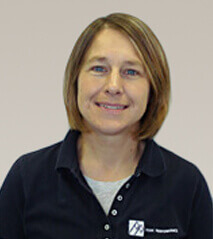 Alicia relocated to Eastern North Carolina in 2006, from Atlanta, GA, where she was employed with Resurgens Orthopedics. Alicia was born and raised in Sayreville, NJ and attended college at East Stroudsburg Univ. of PA, California Univ. of PA, and has received her certification in Neuromuscular Therapy from the Academy of Somatic Healing Arts in 2003. She taught Hydrotherapy and Adjunctive Modalities for 3 years after receiving her certification. Alicia has many years of both management and clinical experience and enjoys seeing the patients at Peak Performance succeed every day. During her time away from Peak Performance, she enjoys CrossFit, Paddleboarding, and spending time with her family, friends and 3 dogs.